Arrive Calcutta. You will be met by our representative at the arrivals lounge and escorted till your check in at Hotel. A mere village in the 17th century, Calcutta is today one of the biggest cities in the world. It is one of the largest ports in the East and the main outlet of West Bengal and the neighbouring states. Calcutta is the commercial hub of Eastern India. Overnight at Hotel. Morning half day city tour of Calcutta visiting the Jain Temple, Kali Temple, Kali Temple, Victoria Memorial, Drive past through Howrah Bridge, Dalhousie Square, Fort Williams, Secretariat buildings, and old court house street. Afternoon in time transfer to airport to connect flight to Bhubneshwar. Bhubaneshwar is the temple city of the east. The ancient city of Bhubaneshwar (Bhuban being world and Ishwar God) is a walk down centuries of temple architecture. It is probably the only city in the world that enables an authentic over-view of the stages of development of Hindu religious architecture. In the fast moving world of today these temples are a gentle reminder of the splendor, the heritage that was once India. Regular dances by the ’Devadasis’ or divine servant girls, rituals and rites, recital of hymns were all an integral part of temple culture. Temples in Bhubaneshwar are built on a common plan as prescribed by Hindu norms. All visible parts of a temple are sculpted with motifs of priests, kings, courtiers, pilgrims, celestial dancers, couples in embrace, birds, animals or scenes from religious epics and legends. On arrival you will be met by our representative at airport & escorted till your check in at hotel. Overnight at Hotel. Morning half-day tour of Temple city. Finest Temples are the Lingraj Temple, Rajrani Temple, Mukteshwar Temple, Parsurameshwar and Brahmeshwar Temple. 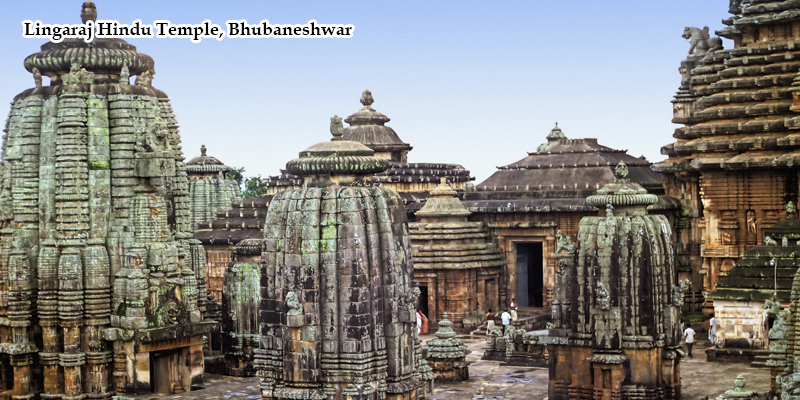 These temples are some of the best specimens of the Orissa Temple Architecture. See the beautiful Sun Temple built in the 13th century in honour of the Sun God. Its exquisite carvings, the life-size statues of Lions and Elephants, collosal figures of warriors on horses, scenes of battle and the chase-all testify to the high standard of ancient Indian art and architectural skill. Visit the place of pilgrimage for the Hindus. the renowned Jagannath Temple built in the 15th century AD and crowned with Vishnu's wheel and flag dominate the landscape at Puri. The temple with its elaborate carvings and moldings are very fine examples of Orissa architecture. (Note - Non Hindus are not allowed inside the temple. Overnight at Hotel. Drive to Gopalpur. Gopalpur-on-Sea is a quiet and charming sea resort along the Bay of Bengal, in the district of Ganjam, Orissa. It offers secluded environment and magnificent sun, surf and sand for most of the year. Balance day at leisure at beach. Overnight at Hotel. Drive to Rayagada. Rayagada is a district of meadows, forests, water falls and terraced valleys, peopled by colourful tribals and many Primitive Tribal Groups. The scenic beauty and heritage on the land is an unexplored paradise. The systematic relationship between men and nature is a feast to the eyes of an outsider. It has its own appeal for the lap of nature. The pattern of peopling of the district show unity in diversity of races, languages and culture. The Schedule Tribes living in the district posses dissimilar economics ranging from food gathering to settled cultivation. Their languages/dialects, societies and culture show inter-societal/ cultural variations because of the persistence of ethnic mosaic formed by communities belonging to scheduled Tribes, Scheduled castes and other castes groups. Sunday Narayanaopatna, Dongasil, Amlabhatta(12 Km). Monday Ambadola (90) KM, Sourapalli. Drive down to Chatikona to watch the interesting colorful weekly market of Dongaria Kondh Tribes. This tribe is one of most primitive tribe of the Kondh’s they live in the high slopes of the Niyamagiri Hills. These people are horticulturists. They grow of fruits like Orange. Pineapple, Banana Etc. The male people are using earring. Nose-ring and keep their hair as woman. Later proceed to Jeypore enroute visit some villages of Paroja tribes. Check in hotel. Overnight at hotel in Jeypore. Visit the weekly Bondal weekly tribal market. Overnight at Hotel. Full day visit surrounding areas. Overnight at Hotel. Vishakapatnam was named after the God of valour, Visakha. Once a small fishing village, it formed a part of the Kalinga empire, under Ashoka in 260 BC., passed on successively from the Andhra kings to Vengi to the Pallavas, Cholas and Gangas. In the 15th century, Visakhapatnam became a part of the Vijayanagar empire. It was transformed into a port town under the British. Now a bustling industrial and commercial city, it is the country's largest ship building yard. The most famous landmark at Visakhapatnam is the Dolphin's Nose, a rocky promontory in the port that is 358 mt. in height. The Ramakrishna Mission Beach, on the east cost and Rishikonda, known for their serenity, are popular with tourists. On arrival transfer to hotel. Overnight at Hotel. The area occupied by Mumbai three hundred years ago was 7 islands inhabited by Koli fisherman and their families. With land reclamation the islands were connected, so that now Bombay occupies a thin isthmus. The British acquired these marshy islands for a pittance. Mumbadevi or Mumbai was part of Catherine of Braganza’s marriage dowry when she married Charles II in 1661. Four years later, the British took possession of the remaining islands and neighboring mainland area and in 1668 the East India Company leased the whole area for 10 pounds per year. You will be met on arrival at the airport & transfer to Hotel. Afternoon city tour. Start with a stop at the Gateway of India –a Indo – Sarcenic style of architecture (1927), designed by George Wittet to commemorate the visit of George V and Queen Mary in 1911, drive, past the Victoria Terminus the most remarkable example of Victorian Gothic architecture in India opened during Queen Victoria’s Golden Jubilee Year, Marine Drive and visit the Hanging Gardens so named since they are located on top of a series of tanks that supply water to Bombay. Visit the Jain Temple built of marble and dedicated to the first Jain Tirthankara. Much of the decoration depicts the lives of the Tirthankaras. And last but not the least, make a brief photostop at “Dhobi Ghat” the Indian laundry system & the Mani Bhawan. Overnight at Hotel.